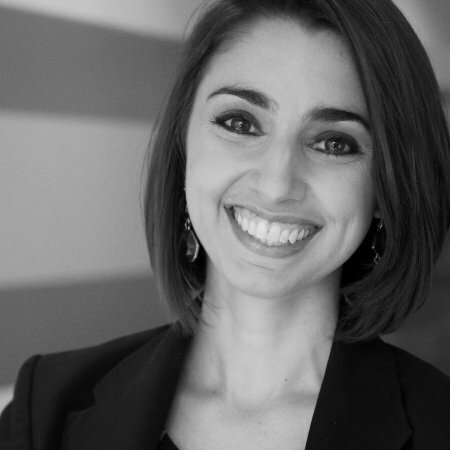 What makes a brand succeed with marketing on LinkedIn? Today we are answering that question by taking a look at companies who have already proved to be successful on LinkedIn and learning from their efforts. These points are simple in theory, yet powerful in practice. Here’s how each of the top global brands fulfill these objectives – and what you can learn from them to apply to your own LinkedIn marketing efforts. The open-ended question invites audience members to comment on the post, and the content addresses a key issue for many leaders looking to improve customer service within their organization. 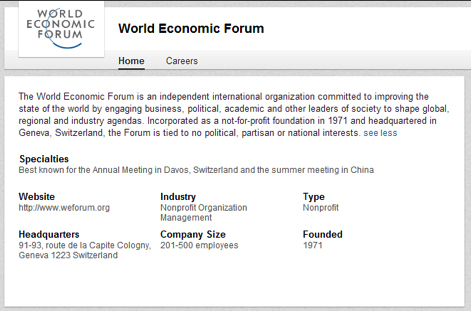 Forbes generally publishes 6-10 Company Page updates per day, promoting on-site content and asking their audience for further ideas. Numbers and statistics are powerful tools in page updates and Sponsored Updates, especially if the results draw widespread conclusions about human behavior. 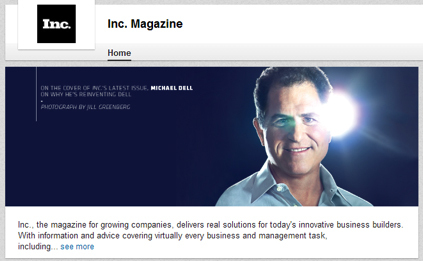 Inc. Magazine serves the business owner and CEO, and their content reflects the C-level purpose. Everything from the simple productivity hacks to complex data analysis is covered here. They also provide additional room for their audience to share personalized knowledge. 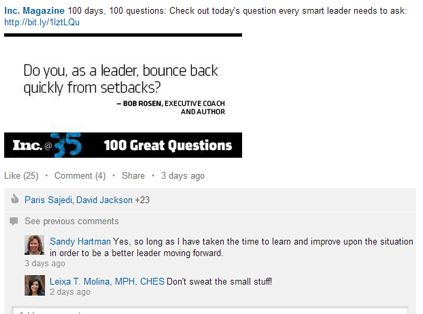 The 100 days, 100 questions campaign curated content provided by the Inc. audience and generated new discussions. In this campaign, Inc. serves as the bridge between audience members – as they are now speaking to each other via the magazine’s Company Page. 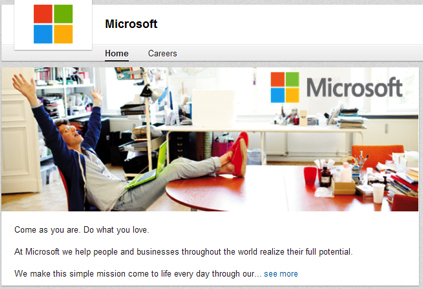 Customers looking for specific information on Microsoft Office need not wade through the overall Company Page updates. They can simply join the Office Showcase Page, which shares more personalized communications for professionals interested in updates around this product. 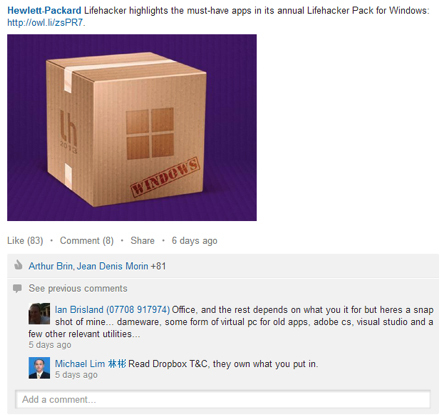 With several other Showcase Pages and LinkedIn Groups tailored to different parts of business, Microsoft does a great job of building a LinkedIn ecosystem for the company's various audiences. 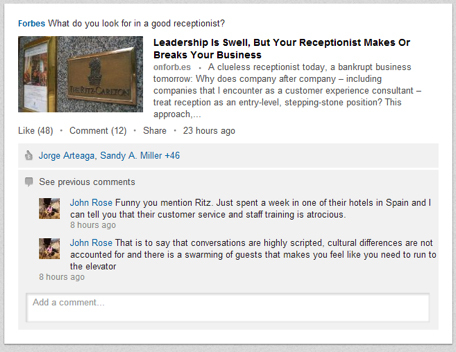 The social managers at Financial Times, the renowned British business and analysis newspaper, love to ask questions. 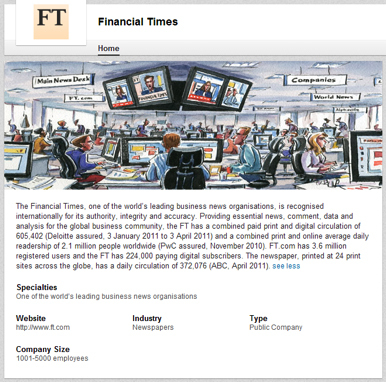 Whether the concept is data-driven or purely hypothetical, the content on FT’s Company Page is directly designed to encourage engagement and audience feedback. What kinds of questions work best? 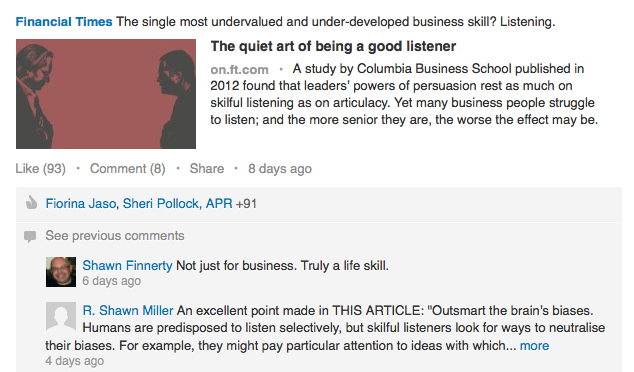 For FT, rhetorical questions or questions with answers validated by research gain good responses - for example, in the above update, asking about the most undervalued business skill. Questions without a definitive answer can also spark conversation among a curious audience. 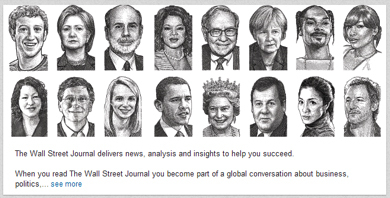 These list preview posts are among the most engaging on the WSJ’s Company Page, as they serve to invite users toward a converting click and discussion. List posts are certainly effective on social – 53% of top performing blog posts on social are lists – and the WSJ uses LinkedIn to tease the list without giving the whole piece away. 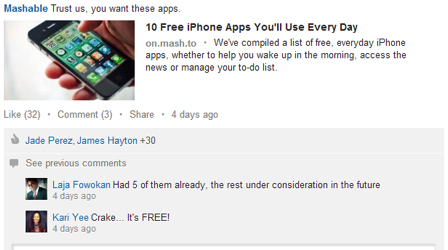 The above post references an article on Lifehacker, a tech-centered blog from Gawker Media. HP isn’t directly mentioned in the article, but they still promoted the content as an educational benefit for their audience. Various resources have debated the “Sweet Spot” between content creation and curation, but it’s clear that Company Pages shouldn’t just be forums for self-promotion. HP generates goodwill among their audience by promoting industry news outside of the company’s walls. 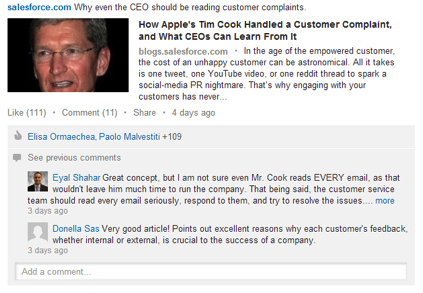 Indeed, we've seen on LinkedIn that top performing posts have lead-in copy around 140 characters in length. For the Salesforce team, the "short and to-the-point" strategy works for them, as the matter-of-fact status updates instantly encourage agreement or disagreement directly in the company’s feed. 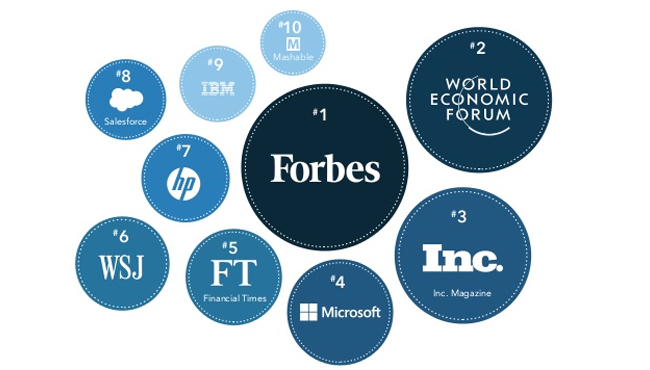 It’s no surprise that several major technology companies top this list – and IBM is included for its dedication to visual content. The majority of IBM’s Company Page updates include some form of visual element – infographics, images, illustrations, and links to YouTube videos. Visual content is a vital marketing tactic – visuals are processed 60,000 times faster than text, so the brain is naturally drawn to graphics and videos. 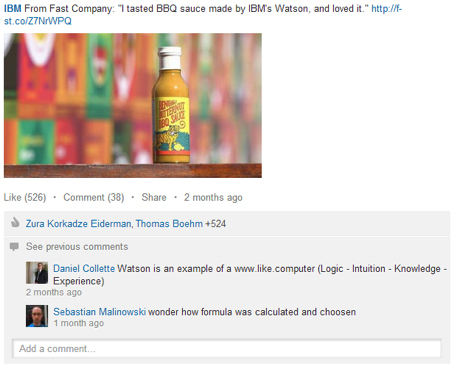 IBM utilizes several forms of visual content in their updates, and the results speak for themselves. 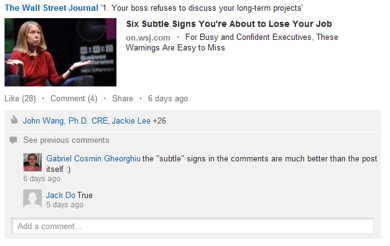 Mashable knows their audience, and they deliver content on LinkedIn with as few strings as possible. This makes the content easier to consume on mobile devices, where much of their audience resides. These brands each have unique strategies for engaging with their audiences on LinkedIn, yet they all represent what makes content marketing on LinkedIn effective – tailored, targeted strategies that reach the right audiences. Wondering what types of content LinkedIn audiences are consuming the most? Get the facts to help inform your LinkedIn content marketing strategy in our 2014 Professional Content Consumption Report.